More residential supply is always welcome news. This translates into more choice for tenants and, consequently, lower rents. 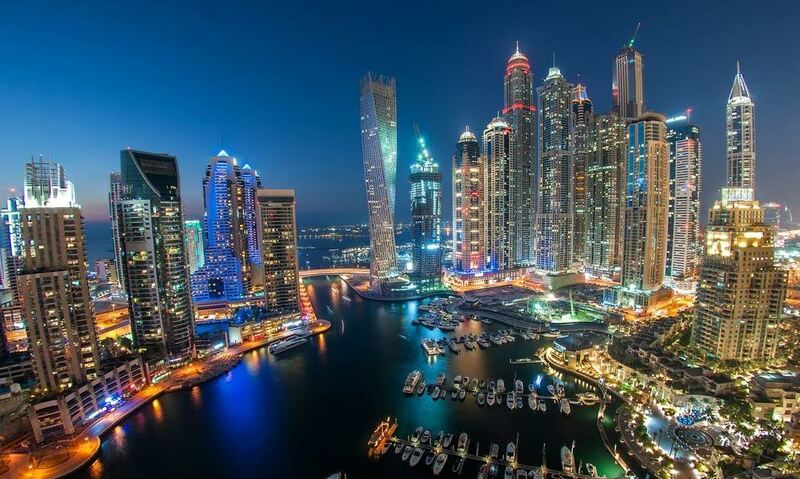 Property consultants Cavendish Maxwell estimate 30,402 homes to be completed in Dubai by the end of 2017. The break-up is 24,259 apartments, 3,778 villas and 2,365 townhouses, according to information obtained from developers, consultancies and sub-contractors. However, keep in mind that the materialisation rate is much lower (estimated at about 50 to 60 per cent) due to construction delays for various reasons and developers phasing out the delivery of units to avoid flooding the market. “We expect to see delays from developers which will push project completions to 2018 and beyond. Developers will continue to delay projects for various reasons such as financing issues, contractual disputes, construction delays and licensing/approval delays. Some developers also tend to hold back completions to avoid flooding the market,” says Lynnette Abad, partner and head of Property Monitor, Cavendish Maxwell. Other consultancies have a more conservative estimate of supply. Chestertons forecasts approximately 15,000 units to be delivered in Dubai this year. “Some 35,000 units were announced to be delivered during 2017. However, a realisation rate in the range of 40 to 45 per cent is expected,” says Ivana Vucinic, head of advisory and research, valuations and advisory division, Chestertons Mena. 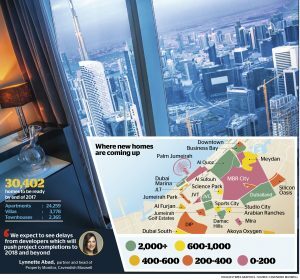 Meanwhile, Core Savills estimates over 3,500 homes were delivered in Q2 2017, slightly higher than the 3,100 units brought to Dubai’s market during Q1. Projects delivered in Q2 include Warsan Village in International City, Dubailand, Dubai Silicon Oasis, Downtown Dubai, Jumeirah Village Circle (JVC) and Palm Jumeirah, notably Five Palm Jumeirah (previously Viceroy), Belgravia phase 1 in JVC and Volante in Business Bay. “We expect deliveries to slow down in Q3 and pick up pace during and after Cityscape in September. Our conservative forecast for the remainder of the year now stands at 11,000 units, with a majority of units to be delivered in the last quarter of the year. Even with these conservative estimates, we expect approximately 20 per cent to 30 per cent spill-over, adding up to around 17,500 units delivered in total in 2017,” observes David Godchaux, CEO of Core Savills. Projects and units to be delivered are likely to be a mix of bigger and smaller developers – master developers will dominate in established central locations while smaller developers are spread across outer areas. “The delivery is a mix of big developers such as Damac, Meraas, Dubai Properties, Nakheel and Tecom, with a number of small to mid-scale developers also scheduled to complete projects this year,” informs Vucinic. There has been a mix of single building/tower completions and the phased delivery of larger communities. “The latter includes the ongoing handover of City Walk and The Polo Residences for apartments, and Reem – Mira, and District 1 of MBR City for townhouses and villas,” adds John Stevens, CEO of Asteco. “In Dubai Marina, we are expecting completion of The Residences at Marina Gate by Select Group which is a total of 1,426 units while the other projects in Marina are smaller with just a few hundred units. In JVC, the majority of projects are smaller, comprising just a few hundred in each,” explains Property Monitor’s Abad. However, market commentators believe the gap between actual and planned delivery will close in future due to the rise in post-completion payment plans and a more cautious and informed approach by master and individual developers when it comes to announcing, constructing and delivering new stock. The additional supply expected for 2017 and 2018 will put further pressure on Dubai rents. “Residents can take advantage of an increase in choice and incentives, while landlords need to be flexible to retain tenants and/or encourage take-up,” suggests Stevens. “Supply can be fairly accurately forecasted in the short term. However, when it comes to demand forces, Dubai has experienced very sudden changes in buyers’ appetite. With other factors excluded, we expect the additional supply to be absorbed without prices or rents declining. However, there are numerous other factors, such as economic growth, oil prices and the global flow of capital, among others, that can influence the change in prices and rents. We expect prices and rents to remain fairly flat until the year end when looking at the market as a whole, while certain communities have their own dynamics and can outperform or underperform the market,” concludes Chestertons’ Vucinic.